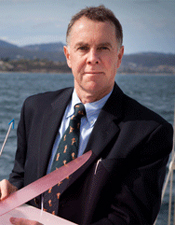 Trevor McDougall is the foremost world authority on many aspects of ocean mixing. He has discovered four new ocean mixing processes and has pioneered the concept of neutral surfaces along which strong lateral mixing occurs. His theoretical work on the three-dimensional residual-mean flow has underpinned the greatest single improvement in ocean climate models in the past twenty five years, resulting in a dramatic improvement in the ability of ocean models to simulate today’s climate. Trevor was born in Adelaide, South Australia on 1 July 1952. His parents ran a small business as painting contractors. He attended Unley High school in Adelaide, enjoying mathematics and science subjects. His family home in this period was directly opposite the CSIRO Division of Mathematics and Statistics (on Waite Rd., Netherby) and this may have planted the seed of the idea of one day becoming a scientist. He was brought up in a closed religious sect (the exclusive brethren) that he left at age 21. He completed his honours degree in Mechanical Engineering from the University of Adelaide, South Australia, in 1973. Dr Gary L. Brown of the mechanical engineering department was an inspirational influence at this time, supervising Trevor’s honours thesis in 1973. He worked as a Research Officer in the department of mechanical engineering, University of Adelaide 1973-74 and as a Design Engineer, Public Buildings Department, South Australian Government in 1974. He was a graduate student at St John’s College, Cambridge, from 1974-78 doing his PhD with Professor Stewart Turner and Dr Paul Linden in the Department of Applied Mathematics and Theoretical Physics at the University of Cambridge, UK. In 1978 he returned to Australia on a Queen’s Fellowship in Marine Science (1978-80) and subsequently as a Research Fellow (1980-83) at the Research School of Earth Sciences at the Australian National University, Canberra. While in Canberra he pursued a private interest and obtained a Graduate Diploma in Economics through part-time study (before the era of university fees) in 1982. In 1983, after five years at the Australian National University, he was appointed Senior Research Scientist at the CSIRO Division of Oceanography in Hobart, as a physical oceanographer. There he was promoted to Principal Research Scientist (1987-91), Senior Principal Research Scientist (1991-96), Chief Research Scientist 1996-2006 and CSIRO Fellow (2007-2011). His research concentrated on fundamental issues in the field of ocean mixing and particularly how the known conservation equations should be properly averaged and included in ocean models. His research, on the full range of oceanic scales ‘ from the very smallest mixing processes at centimetre scales to the mesoscale (~100 km) eddies ‘ has had a major impact on our understanding of mixing and its representation in ocean circulation models. Research into ocean mixing is important as the ocean and the atmosphere play roughly equal roles in transporting heat from the equatorial region to the poles. One of the ways the ocean achieves this poleward heat flux is through the vertical overturning circulation. The strength of this circulation depends to some extent on the strength of small-scale (10 cm scale) mixing processes. Many aspects of his work are now included as basic building blocks in the standard ocean models around the world. He is known internationally for his work with CSIRO’s Dr David Jackett on defining the ‘neutral density surfaces’ along which the energetic mesoscale eddies mix in the ocean, and the way in which mesoscale mixing processes should be represented in ocean models (the Temporal-Residual-Mean (TRM) velocity). As other aspects of ocean models have improved over the past twenty years, mixing and its representation has become more important for modelling the ocean’s role in climate change, so that Trevor McDougall’s fundamental advances have become central to the field. His original contributions have given rise to new concepts, new variables and new words which are now in common use in physical oceanography:- the new words include ‘thermobaricity’, ‘neutral density’, ‘conservative temperature’, ‘absolute salinity’, ‘preformed salinity’ and ‘neutral helicity’. During his time at CSIRO he had four six-month periods working overseas ‘ twice (in 1985 and 1994) at the Woods Hole Oceanographic Institution (Cape Cod, Massachusetts); at the School of Oceanography, University of Washington, Seattle in 1989; and at the Univeristy of Kiel in Germany in 1997. Trevor McDougall currently chairs an international working group that has redefined the thermodynamic relationships that characterize seawater (enthalpy, entropy, salinity etc). The Australian, 21 April 2012, ‘Top oceanographer joins UNSW’, www.theaustralian.com.au article. Thermodynamic Equation Of Seawater ‘ 2010 (TEOS-10).